Another involvment of the Dutch army in Asia was in Korea in 1950-53. In total, 3,972 Dutch soldiers served in Korea, and 123 never returned. From 1960 to 1962, the war with Indonesia over New Guinea lasted until Dutch troops retired and an international agreement was set up. The Army re-equipped itself as a part of NATO, which the Netherlands joined early on and formed the I (Netherlands) Corps, assigned to the Northern Army Group. Its duties were to relieve the 1st German Corps forces ASAP, devise tactics to integrate into COMNORTHAG’s vision of covering force battle, assume main defensive battle duties and maintain cohesion with LANDJUT while securing NORTHAG’s left flank. Exercise Allied Spirit I, Hohenfels, Germany. -Bosnia-Herzegovina, Croatia, Macedonia and Kosovo 1991–present: In Bosnia, the Dutch army was heavily criticised for their passive stand during the Srebrenica massacre. They were present since 1999 with the NATO Kosovo Force. -Iraq 2003–2005: 1,345 troops from Landmacht and Dutch Marines were deployed with helicopters at Camp Smitty near As Samawah (Muthanna Province), and lost 2 soldiers in an ambush. -Afghanistan 2002–2010: From mid-2006, the Dutch Special Forces Corps (Commandotroepen) operated successfully in Tarin Kowt, protecting engineers working on a large base. Later in summer, 1,400 troops were deployed to the Uruzgan province (Southern Iraq), 200 served at Kamp Holland, and Deh Rahwod. 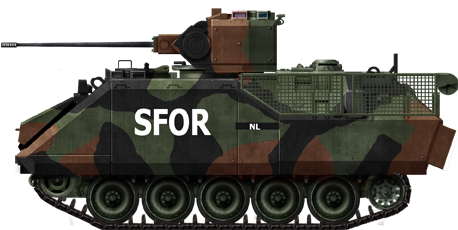 These forces were backed by AFVs of the 44 Pantserinfanteriebataljon Regiment Johan Willem Friso and 42 Tankbataljon Regiment Huzaren Prins van Oranje, operating PzH 2000 self-propelled guns. Dutch troops also actively participated in Operation Medusa and at the Battle of Chora. On this occasion, 96 Australian Bushmaster MRAPs (mine resistant ambush protected) were used (10 lost in Uruzgan and Kunduz provinces). However, massive budget cuts had ineluctable consequences. On April 8, 2011, the Dutch Ministry of Defense dissolved the last tank unit and sold the remaining Leopard 2s (about 445 had been in service, most were sold). As of today, the core fighting consists of three brigades, the 11th Airmobile Brigade, 13th Light Brigade and 43rd Mechanized Brigade. The Royal Netherlands Army is a volunteer force, and the compulsory military service has been suspended. The Royal Marechaussee is also a volunteer force. There is a military academy (Koninklijke Militaire Academie) in Breda. There is a Korps Nationale Reserve counting three mixed regional oriented battalions similar to the UK’s Territorial Army. The bi-national Army Corps I. German/Dutch Corps is a rapid deployment Army Corps, part of NATO’s response force. The battalion is based at Münster (Germany) and Eibergen (Netherlands). AMX-13/105 NL (here “B16” from the 103rd reconnaissance batallion Cavalerie Verkenningseskadron in 1985). About 200 AMX-13s were in service with the Dutch Army. AMX-VCI, about 300+ VTT 12.7 HMG APCs and other variants (VCC TOW below) derived from the AMX-13 chassis were also in service until the 1980s. YPR-765S were the main AIFVs of the Dutch Army, locally produced from 1975 in several variants. They are all retired now. It was based on the M113 American APC also used by Belgium. Some served in Afghanistan. All have been replaced by CV9035NLs IFVs and other wheeled vehicles. Only 18 Leopard 2A6 are maintained in active service (provision for 48), a single battalion. BAE CV90: Of the 149 vehicles bought, 92 were kept in reserve (in 2014, 44 were sold to Estonia), and 17 for training. Panzerhaubitze 2000. 57 bought, 33 in storage, 18 active and 6 used for training. LGS Fennek: 365 in active service. Types used: Reconnaissance (144), General Purpose/Cargo (63), Medium Range Israeli Gill Missile (48), SPAAML with Stinger (18), Forward Observer (45), Mortar Carrier (39), Tactical Air Control and Target Designation (8). GTK Boxer: 8×8 APC, 200 in active service, counting Command (36), Ambulance (52), Engineering (80), Repair (12), Cargo (18) and Driver training (8) variants. Luchtmobiel Speciaal Voertuig, about 160 of these multi-purpose airborne wheeled vehicle were built in the Netherlands, pending replacement. 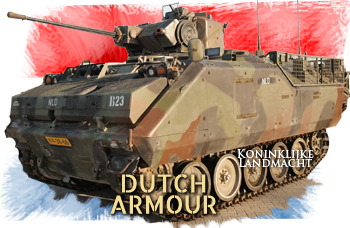 The modern Dutch army also counts several German specialized AFVs, namely 6 NBC recce 6×6 Fuchs vehicles, 18 Buffel ARVs, 20 Bergepanzer 2s, 4 Leguan bridge layers and 10 Pionierpanzer 3s. Given our logic we always attach an AFV to its builder, even if the model was exclusively exported. Other examples will be the Stingray (Thailand only) and the Sabra (Turkey only). The long line of Marmon Herrington tanks has been planned also for the USA but three models will also show off on the Netherlands page (MTLS, CTMS, CTLS).